If you want to Status Match Delta Air Lines, now is a good time to do so! Back in “the day” is was a simple thing to get a status match with Delta. You simply faxed over your card and statement to Delta and “bing” you were medallion. You can Status Match with just about any airline but most of the time it is a one shot deal – EVER! I did a status match to Continental to Platinum before they became “United” as I think I could do it again with United now if I would want to. I also did one with KLM (why? just because I could and wanted to see how good they were to their own PM’s), from Continental Platinum when they offered that last year. 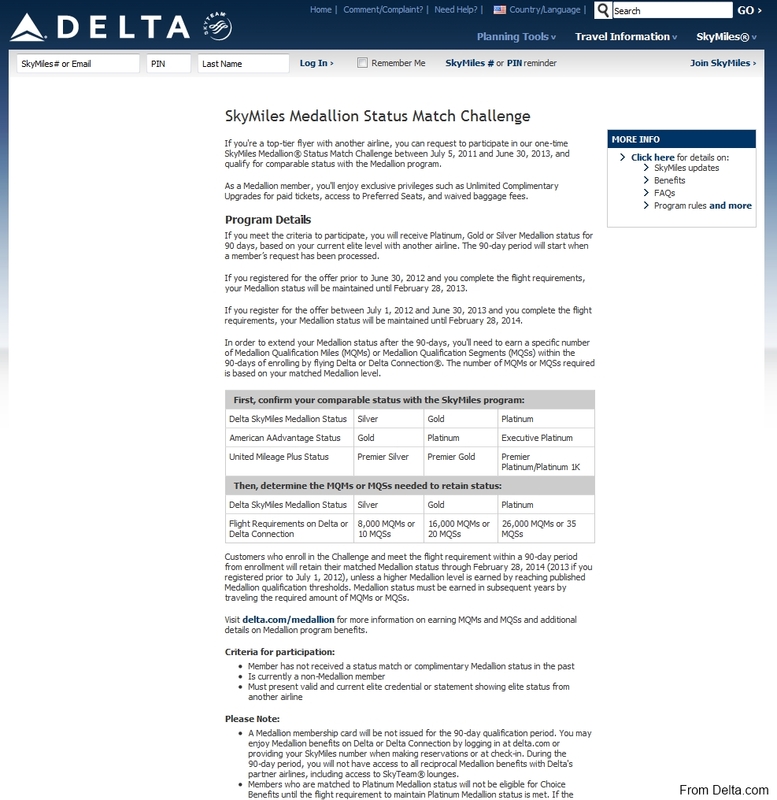 Now to Status Match with Delta, you must “FLY” to keep your status match during the “challenge” period. After July 1st each year is a good time to do this as if you do you get the better part of 2 years status (19 months) this way (i.e. match NOW and earn status good till FEB2014). Also, please note that “officially“, per DELTA rules, all the MQM’s must be flown miles i.e. “flight requirements“. MQM’s from other sources like a Delta AMEX card do not count nor would say a bonus from a AMEX Membership Rewards transfer bonus count. Before you comment, “I did a match and got 10k AMEX credit just fine”, I said officially. If you “roll the dice” and try that route, it may work if no human looks at your account. But, if a human does, they may kick it out so be careful or know what could happen. A Medallion membership card will be not issued for the 90-day qualification period. You may enjoy Medallion benefits on Delta or Delta Connection by logging in at delta.com or providing your SkyMiles number when making reservations or at check-in. During the 90-day period, you will not have access to all reciprocal Medallion benefits with Delta’s partner airlines, including access to SkyTeam® lounges. Members who are matched to Platinum Medallion status will not be eligible for Choice Benefits until the flight requirement to maintain Platinum Medallion status is met. If the member does not meet the flight requirement, the member will not be eligible for Choice Benefits. Through this offer, you may maintain the same or lower Medallion status level as your matched status. If you are matched to Silver Medallion status, you will not be able to earn Gold Medallion status through this offer, even if you will fly more than 16,000 MQMs or 20 MQS’s during the offer period. But if you have been matched to Gold Medallion status and you only fly 8,000 MQMs or 10 MQS’s you will earn Silver Medallion status. Your Medallion status will be returned to non-Medallion status if you are unable to complete the minimum flight requirement within the 90-day period. PS – be sure and check the up-to-date post about Status matching HERE! ← Time to giveaway all sorts of Luggage tags! Sorry, I missed the main point of the post: why is this a good time to do a status match? @Hans – before July 1st each year you only get the match till FEB2013. After July 1st each year, you get till FEB the following year. Clear? “If you registered for the offer prior to June 30, 2012 and you complete the flight requirements, your Medallion status will be maintained until February 28, 2013. This isn’t really a status match, but a status challenge then, right? I have a ton of Delta travel booked for the next 45 days (18k miles to be exact), but I don’t have any status on any other airline. So to be clear, I wouldn’t qualify at all, right? Even Silver Medallion would make life so much more pleasant!! Though having a Delta Amex makes it a little easier. @Shawn, the reference is to “Delta Private Jets” program. AFAICR, the minimum buyin for a 2-year card is $50,000. It grants you Diamond, and can also be used for commercial travel. So if you were the sort of person with a lot of expensive travel it would make sense I suppose. For the rest of us, it’s just a dream. Hmmm… If I challenged for Gold would the 16k MQMs that I acquire within the 90-day period be eligible for the 100% mileage bonus? I just status matched to Platinum from Aug to Nov and I flew 49K MQMs. As a Platinum with only 49K MQMs in 2012, my question is how many if any of my 2012 49K MQMs will carry over into 2013? @David – per Delta.com you will ONLY have rollover above your status level. So, you would have to fly 76k to get 1k rollover this year under the terms of the status match. Members who are eligible and complete the Status Match Challenge are ineligible for rollover MQMs unless they earn more MQMs than the gifted status requirement. For example, if a member is gifted Silver Medallion status in 2012 and also earns 30,000 MQMs in 2012, s/he will be able to roll over 5,000 MQMs since the Silver Medallion requirement is 25,000 MQMs. @ls – let me see what I can do I will email you.